MyLifeOrganized 5 for Windows has been released! 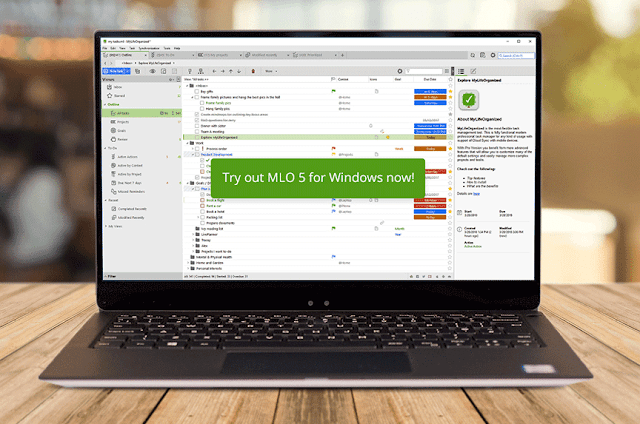 The MLO team is glad to announce that MyLifeOrganized 5 for Windows is now live! It was a long way to the major update of the application we all love and use every day. We are very grateful to all our beta testers for their time, efforts, priceless feedback and endless support. You have been our best companions in this journey! With a new polished, clean and more intuitive interface MLO is now even more effective and convenient in usage. We have redesigned MLO 5 trying to achieve as simple and clear user interface as it is possible in such a sophisticated software. In addition to the above-mentioned, there are more than 70 small issues fixed and handy improvements added. Learn more what's new and how to upgrade on our website. The new version is completely free for the first 15 days for the current MLO users (45 days for new users). After that to continue using the new features you can proceed with free or paid upgrade. In any case, you can always return to the existing version. Note: If you are a registered user of MLO 4, you get a 50% discount for upgrade to MLO 5. You may be wondering if it is wise to invest in upgrading. Here are the main reasons why the upgrade to MLO 5 is beneficial. We hope the new MLO 5 will be your most effective assistant in mastering tasks and achieving goals. Thanks for choosing MyLifeOrganized, stay tuned! Life is easy when organized! Sorry, but it looks like a small update, not a major release at all. Can't see a reason to upgrade even with a discount.